Now when doing the discharge test for capacity , there was an interesting turn of events : Lets check out the graph I made . Here you can see where in the voltage range the capacity or energy is coming from at various discharge rates . Now most of my lights , actually dont run when the battery gets bellow 3v , so ? Now if your running a multi 18650 , I dont see a real problem depending on where the voltage on the driver may or may not turn the light off . [ Actually this may be more of an issue ] Sorry , I was tired and lots of homework to do , see link . Thanks very much for the review! Frontpage'd and Sticky'd. Very useful Old! much appreciated. So are these results in anyway linked to the PCB or would the unprotected version have the same results? I nearly bought these for my Solarforces as well, glad I didn't. I got the Sanyo. Old, where did this cell come from and what does it cost? Oh, and thanks for the review - the new graph format is interesting. I dont think the discharge has anything to do with the protection circuit .. The Panasonic 3100 is a laptop battery , and was designed to be safely discharged to 2.5v ... Other batteries are designed to be safely discharged to 3v or 2.75v and deliver most of there energy above 3v , but looks like the Panasonic 3100 is a different animal . And discharging at lower AMP's did not show this up .. Kind of glad my old charger bit the farm now . In a high powered single 18650 set up , hmmmm , maybe not the best choice . Well Old, I must say, thank you again for this review. I have seen a review based on the non-protected version and it got glowing reports. But they did not test it as you have done here. Which is vitally important as most people seem to have single cell lights. I can only imagine there may be a lot of unhappy people out there who have bought the various different versions of these cells. If I read your graph right, my solarforce XML draws 2A and will not work below 3v, Therefore these could be the worst cells possible. They may even struggle in my BC 40, as that seems to cut off at around 5.5v. Ok what I would take from this is the voltage sag under load , which manifests itself @ 3A discharge rather dramatically . Ok a flashlight is not going to maintain a 3A discharge to 3v , thats not going to happen , unless its one heck of a boost driver . Whats going to happen is the voltage sag may affect output @ higher current draw .. But this battery discharges well enough .. But still , less voltage sag = better output .. So if you have a high discharge 2 x 18650 , it might reach the drivers protection point up to 50% faster ..
OK Old, But surely there is still a problem reaching the full capacity of these cells. If my Solarforce turns off at 3v, I am going to miss quite a bit of mAh. Am I not? OK, I see what you mean about not being able told sustain a draw of 3A. But I thought the driver would draw more Amps as the voltage drops. Is that not correct? I am by no means an expert, so I could be misunderstanding how they work. If it's a boost driver - yep, that's how it'll work, but most single-cell 18650 lights have linear drivers, which decrease current with voltage drop. Ah ok. But does that mean the torch becomes less bright as time goes on? If so, would that not be a little like an unregulated torch? And does that also mean that these panasonic could still be a little short on capacity in two cell lights? If so, it does sound like the Sanyo 2600 are hard to beat. Ah ok. But does that mean the torch becomes less bright as time goes on? Only after voltage at battery drops below Vf of LED, while it's same or higher than Vf, brightness is regulated. And does that also mean that these panasonic could still be a little short on capacity in two cell lights? Most two-cell lights are in 1A to 2A range and work from 5.5V (and up), so you're getting 2.8 - 3 Ah from those cells. So its in multi cell lights , where this discharge curve will most likely affect owners , especially in high powered applications ..
And single cell lights will most likely , simply behave normally .. Which is why I put that example of a run time test there , How well a single cell light maintains regulation depends on the battery driver emitter combination and the current draw . Lets say you just got yourself a 5 x XM-L wonder Rod ! If we do some maths , then we will see that 2 x 18650 @ 8.4v would need to supply 5.2Amp , that is a some what unreasonable expectation .. Still , bear in mind the light may have a safety cut out at 5.5v - 6v , so the 3 x 18650 set up is going to drain hard without some inbuilt safety .. 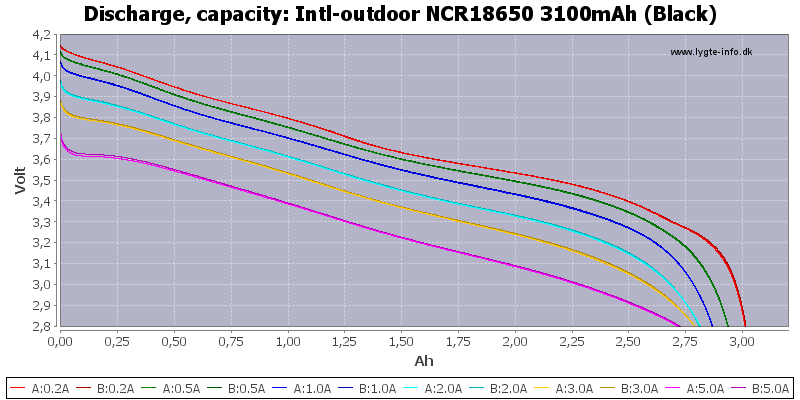 But with the 2 x 18650 , we can see , that this battery is going to be pushed hard [ to the wall ] , be it multi XM-L or SST50 or SST90 , there will be issue on high as the voltage sag will really affect run time [ on high ] .. So the battery may be fine in one application , not so great in another , and maybe fantastic in another ..
3 x 18650 = Should be fine as the voltage is much higher . I have ran about 10 test on these cells HERE they are good cells, but will not work in all flash lights due to the button top and not all lights can go to 2.5 volt or 5 volt in multi cell set up's as an example my lights cut off around 3 volt and 6 volt so i can not use all the mAh of the batteries. Yes that is a big difference! Are your Sanyo's un-protected? I know it doesn't make any difference, I just wondered. Thanks for this info, very useful. Yes I saw that post it was excellent. The reason I asked about the sanyo's is that I have just order a couple from Kaidomain and wondered if they had a button top. They seem to, but a very small one. But you can answer the question for sure. Once again, thanks Jeansy and keep yourself dry where you are! Thanks, it's sunny at the minute here but all around is flooded and we are threatened with a hose pipe ban due to the drought! Crazy! Anyway, the Sanyos work fine in my Xtar charger and in all the single cell torches I've tried but they will not work in multicell lights without modding or magnets. I have simply cut away some insulation and they work fine, this avoids magnets and thus extra resistance but you have to be careful either way for fear of short circuits. So no it's not really a button top as per AAs where they sit proud.